Again, your situation is that you have two trappers working in the wilderness. They have two options: (1) set traps, or (2) poach from each other. If they both decide to trap all day, each catches on average two animals a day. Draw in Each 2 or something similar in the box where A and B both decide to trap. 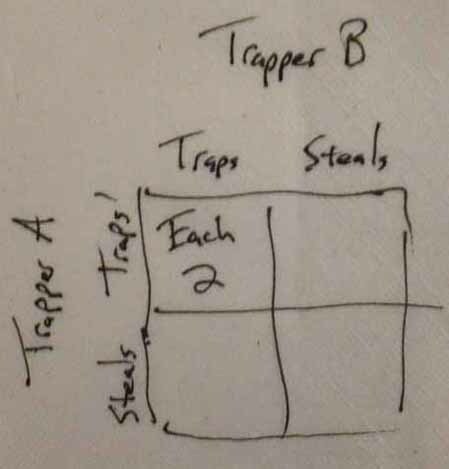 If, however, one of them traps while the other poaches, then the poacher gets two animals, the honest trapper none. And, the poacher doesn’t have to work as hard. 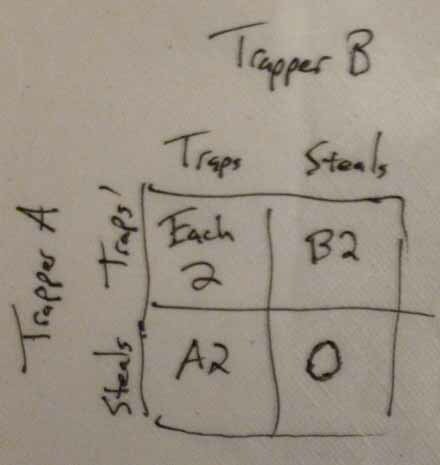 Draw in A2 and B2 in the boxes where one steals and the other traps. Obviously, in the situation where one decides to steal, very quickly there’s no incentive for the other trapper to work. So very quickly, he may decide to steal as well. This leads to the third situation where both trappers decide to poach. 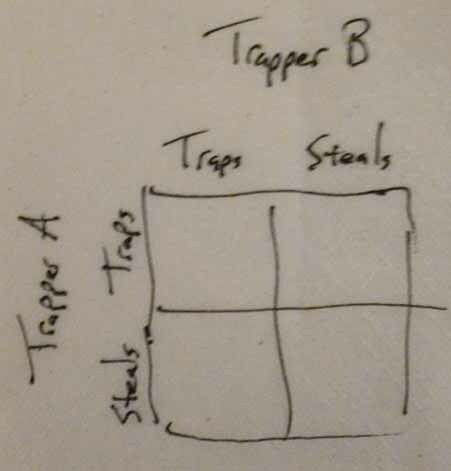 In this case, everyone goes hungry because no one is trapping. Everyone acted in their own best interest, but overall the system breaks down. 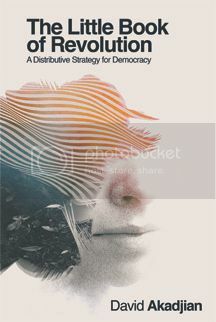 In order for markets to function correctly, people must refrain from all sorts of criminal behavior: stealing, not paying, lying, coercion and so forth. It’s in everyone’s best interests to abide by these rules. But that doesn’t mean they’ll do it. This is why we have government. This is why we have to have rules and why they need to be reinforced. There is no such thing as a “free” market.